Round pewter coal oven. A lovely item for the room ca 1880.Fine in a Gottschalk or Hacker house This is rare, because the original top is intact. A lovely item fort he smaller German dollhouse.Wonderful ornamented in a great condition. "Kanonenofen"
Lovely rare beautiful early biedermeier bristol glass teaset. Miniature Very delicate. It comes with its original box with tray.6 cups, plates. spoons, pot, sugerbowl. A rare set with lovely decoration from ca 1840. Wonderful for a large dollhouse or as accessoires for an early doll.So pretty and in great condition. A rare original set.So delicate for an early doll. OUTSTANDING complete Gottschalk BEDROOM W. ORIGINAL BEDDINGS.Scale 1 (see the messurments below! This 5 piece set is absolutely MINT! German 1890. The color, the style the decoration. is so wonderful. It gives me association to Wiener Werkstatte. All pieces of furniture are decorated in brown and black colours.. What a beautiful work! It has two pretty beds with soft purple bedcovers with art nouveau decoration. Two nightstands with working door and drawers. The cupboard has a mirror in the middle, doors to open. All pieces with original pewter handles. All items are made of solid wood! Dimensions: Beds: h. 2 1/2" x L.6"x D. 3 1/4" Cupboard: H. 6"x W. 4 1/4" x D. 2" Bedstands: H. 4"x W. 1 3/4" x D. 1 1/4" Do not hesitate to contact me for further information! Wonderful large Swedish Dollcabinett/Dollhouse. Swedish dollhouse from 1880. Original all over. 3 story, 6 rooms all with windows and doors between the rooms. Original painting,lovely drapes, carpets and wallpapers in beatutiful design comes with the house. 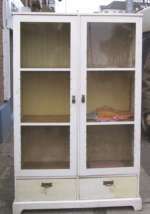 Glass wooden front and windows, freeblown.. Two drawers. Totally unrestored.All brass handles and locks are original. Higly decorative. High 2 meters/ 80 inches. A large house with great possibilities for decoration. Also a house, that will fit into your home without being too "dolly" Ask for more photos. This is the kind of houses, that were produced in Sweden and Holland. A Wonderful ormolu Jugendstil Mirror/ console.About 1890. This is such a pretty piece of furniture, that you can use in your rooms or in your dollhouse hall. It is bright golden, has the origional mirror. No dent or discollouring to the gold! 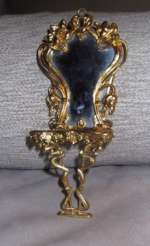 This is a pretty and very rare mirror with console and it is real "jugenstil"! No restoration. Evarything original. Will be fine in a medium seize dollhouse 1:10, But would also be geat in the hallway in a 1:12 dollhouse. Do email me fur further questions! 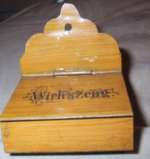 Shoeshine box, Märklin. Doll accessory. Shoeshine box, Märklin, Germany.Ca 1900. Brown metal with the German title "Wischzeug" painted in black on the front. The box contains brushes, cloth, so your dolls shoes will be really clean.Larger scale.Everything origional and in great condition! A lovely set. Size 2 1/2" /7 cm wide. Lovely for the tea party! 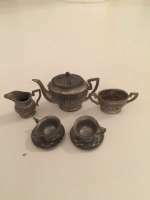 This dollhouse pewter tea set has 2 cups,2 sauces and a teapot with lid, suger bowl and cream can.Lovely decoration. The teapot is 1"tall. All pieces are in very nice condition.Germany Circa 1900. Kleiner goldener Medizin-Wandschrank für die Puppenstube mit schönem Inhalt. Kleiner Jugendstil-Medizin-Wandschrank für die Puppenstube. Der Schrank ist aus goldbemaltem Zinn hergestellt. Tür zum Ôffnen. Im Schrank sind 6 Medizingläser und Gaze. Größe:h. 7 cm x 3,9 cm cm. Hergestellt in Deutschland um 1890. Sehr guter Zustand.